(HUTTO) – Three employees at Texas State Technical College in Williamson County have been honored for their work and skills. 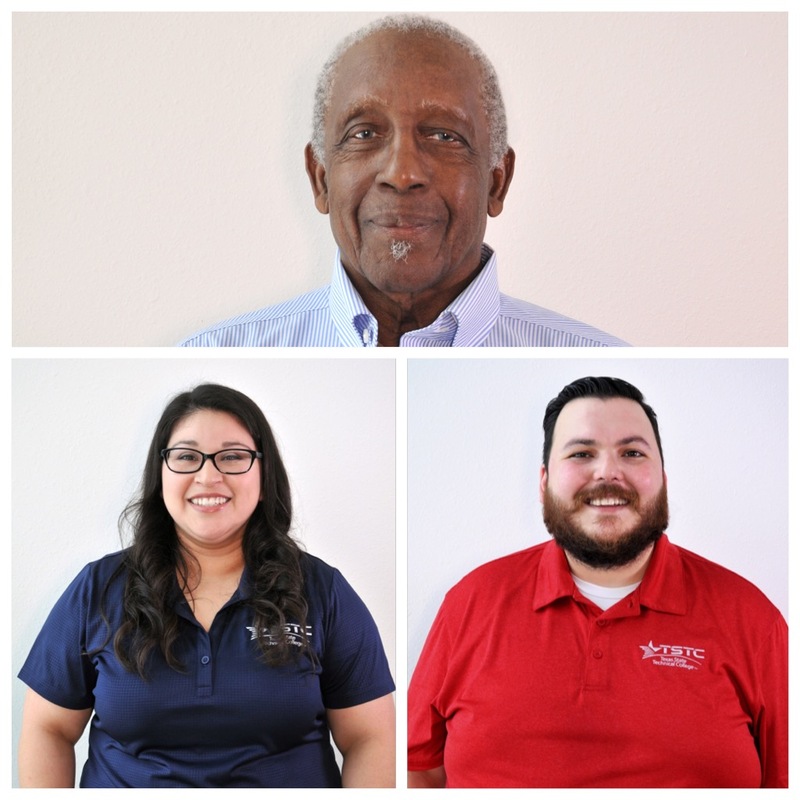 George Fields, an Industrial Electrical Systems instructor; Abigail Flores, an enrollment coach and Michael Smith, an associate field development officer for The TSTC Foundation, have received Chancellor’s Excellence Awards. Fields has been at TSTC for seven years. Flores works with TSTC students from enrollment until they graduate. “What motivates me is knowing that we are helping our students improve their future,” she said. Flores worked for 10 years at TSTC in Harlingen before moving in 2017 to TSTC in Williamson County. She is a graduate of TSTC’s Business Office Technology program. Smith’s job is to build long-term and sustainable relationships for the campus and increase The TSTC Foundation’s ability to provide financial assistance to students. Smith has worked for three years at TSTC. Fields, Flores and Smith will join 32 other TSTC employees statewide who will be honored at the National Institute for Staff and Organizational Development’s Excellence Awards Dinner and Celebration in May in Austin. This entry was posted in Williamson County on April 17, 2019 by Daniel Perry. (HUTTO) – Texas State Technical College recently received an in-kind equipment donation from a Georgetown company. Trendsetter Electronics gave capacitors valued at more than $19,800 to the Williamson County campus in Hutto. Capacitors are two-terminal electrical components that store energy used in circuits. “You have a great school, and it is our honor to be a small part of enriching the lives of TSTC students and our community,” said Lori Rutterford, the company’s data integrity manager. Michael Smith, an associate field development officer for The TSTC Foundation, said the equipment can be used in programs that deal with electricity, like Biomedical Equipment Technology, Instrumentation Technology, and Electrical Power and Controls. “They have been a great partner, and you will see a lot of developments out of Georgetown,” Smith said. Trendsetter Electronics previously donated electronic components in 2018 to TSTC. The company distributes active, electro-mechanical, interconnect and passive electronic parts for the oil and gas industry and the instrumentation field. This entry was posted in Williamson County on March 26, 2019 by Daniel Perry. (HUTTO) – Members of Hutto High School’s Class of 2019 will be the first to benefit from a new scholarship to attend Texas State Technical College that was created by the city of Hutto, the Hutto Education Foundation and The TSTC Foundation. The three entities are contributing money to help Hutto graduates pay for pursuing certificates or associate degrees at TSTC. The city is contributing $25,000, while the Hutto Education Foundation is still determining what it will provide financially. The TSTC Foundation will match both contributions. Hutto Mayor Doug Gaul said the idea of Hutto students graduating from high school, pursuing a technical degree and staying in the city is appealing. “We are doing the first two semesters, and the Hutto Education Foundation is doing the other two semesters,” Gaul said. Lizzy Samples, director of the Hutto Education Foundation, said their scholarship contribution will be for Hutto graduates who take at least 24 semester credit hours at TSTC. “It is our mission that the students receiving this funding also have the drive to want to complete their education,” Samples said. The three entities are expected to consider in upcoming years how much to contribute for future Hutto graduates to use. “We feel like this is a really interesting and neat initiative that we hope the high school students get on board with,” Samples said. Hutto High School students planning to attend TSTC this fall can talk to a TSTC recruitment representative for more information. Current TSTC students who graduated from Hutto High School can contact a TSTC admissions representative for more information. This entry was posted in Williamson County on March 1, 2019 by Daniel Perry. (HUTTO) – Lauren Caprio got her first welding job in 2016 shortly after graduating with a certificate from the Welding Technology program at Texas State Technical College in Williamson County. Caprio, 33, of Pflugerville is a level III ultra-high-purity welder at Dynamic Manufacturing Solutions in Austin, where she works in a humidity-controlled clean room with employees wearing white protective gear to do tungsten inert gas welding and orbital welding. The controlled climate means employees can work with very pure materials to ensure quality for the biomedical, pharmaceutical and semiconductor industries. The longer Caprio has worked at the company, the more complex her training has become. Seventy percent of what the company has produced in the last 12 months has been exported overseas. The company primarily looks for welding job candidates at TSTC and other two-year institutions. “Building relationships with employers is essential to the success of our graduates and the TSTC mission,” said Edgar Padilla, provost of TSTC in Williamson County. Misso said students learning about welding should think more high-tech as the industry evolves into automation and robotics. Parents and school counselors can play a role in encouraging students to pursue welding. Misso said China, Vietnam and Malaysia are some of the nations he keeps an eye on regarding their technology. He said these countries have lower land costs, but the work quality does not compare to what is created in the U.S.
“For us to bring the jobs back to the U.S., we have to use technology to have a step up on other parts of the world,” Misso said. Welding jobs in the United States are projected to grow to more than 427,000 through 2026, according to the U.S. Bureau of Labor Statistics. And, welding factors into industries such as aerospace, construction and manufacturing that the Texas Workforce Commission considers as being in-demand and high-earning in the state. 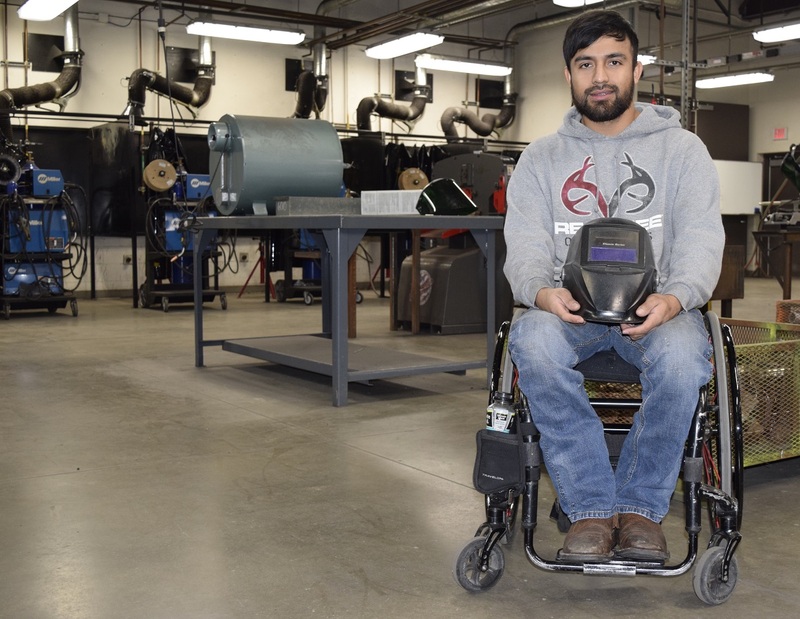 “Welding is an interesting science in that the physics of welding will never change, but the methods of teaching and technology available to do so will continue at a rapid pace,” Padilla said. This entry was posted in Williamson County on February 1, 2019 by Daniel Perry. (HUTTO) – About 70 area educators learned Tuesday how Texas State Technical College’s technical programs can support the state’s economy. 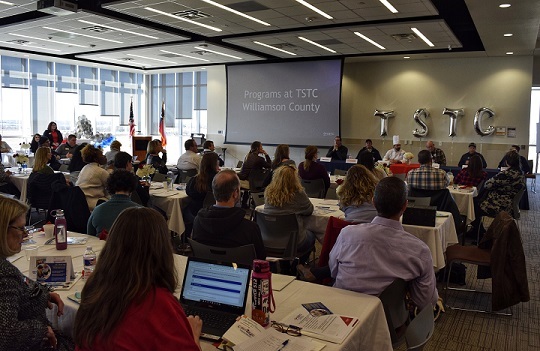 The TSTC Spring Counselors Update held at the East Williamson County Higher Education Center in Hutto featured talks from TSTC staff about the registration process, dual enrollment and certificate and associate degree options. Josh Schier, chair of the Cyber Security program at TSTC, said the field needs problem solvers. He said there are about 10,000 jobs open now in cyber security in the state, with the Austin area being one of the places with opportunities for graduates. Darren Block, statewide chair of the Precision Machining Technology department at TSTC, said students who graduate with a certificate in the field typically make at least $18 an hour,while those with an associate degree can make at least $22 an hour. Ed Latson, executive director of the Austin Regional Manufacturers Association, told attendees that manufacturing is the top contributor to the area’s gross domestic product. He said there are about 1,500 manufacturing companies with about 57,000 jobs in the area. Many of those jobs are technology-based. Some of the skills companies are looking for in potential employees include the ability to read drawings, take measurements, do mathematics, drive forklifts and complete shop paperwork, Latson said. But, companies also need people with good communication skills. Liane Kerkman, a teacher at Wayside: Sci Tech Middle and High School in Austin, visited TSTC for the first time on Tuesday. She said out of this year’s 34-member senior class, about half are considering two-year secondary education options. Kerkman said TSTC’s Cyber Security program could spark her students’ interest. Shirley Reich, a college and career coordinator at the Hutto Independent School District, said she was surprised at the number of jobs available in technical fields. She said the labor market will give staff more information to guide students on their post-high school paths. This entry was posted in Williamson County on January 29, 2019 by Daniel Perry. (WACO) – Students at Dillard McCollum High School in San Antonio are starting the year learning in new dual enrollment classes through Texas State Technical College in Waco – a first for TSTC and the Alamo City. Eight juniors and seniors are taking Introduction to Automotive Technology and Automotive Suspension and Steering Systems in the Automotive Technology program enabling them to receive high school credit and technical college hours. TSTC credentialed the high school’s automotive technology teachers, Mark Emmons and Michael Martinez, to teach the dual enrollment classes. Rudy Cervantez, TSTC’s statewide Automotive Technology Department chair, said approving the teachers and high school after a site visit was easy because they already had certification from the National Automotive Technicians Education Foundation. “They have a nice shop and I was impressed,” Cervantez said. Talks between the Harlandale Independent School District and TSTC began in fall 2017, said Tracy Anderson, the school district’s career and technical education coordinator. TSTC has supported the school district’s college-going culture in other ways. San Antonio is home to Toyota Motor Manufacturing, Texas Inc. which employs 2,900 employees including TSTC graduates, according to the San Antonio Economic Development Foundation. Toyota’s presence helps make Texas in the top 10 among states for automotive manufacturing employment, according to the Texas Economic Development Division’s “The Texas Automotive Manufacturing Industry” report. “There is a lot of potential for jobs for the students,” Cervantez said. This entry was posted in Waco, Williamson County on January 24, 2019 by Daniel Perry. (HUTTO) – Students at C.H. Yoe High School in Cameron recently ended their first semester taking dual enrollment classes through Texas State Technical College. Twelve students completed the Principles of Accounting I class as part of the Business Management Technology certificate. And, more than 30 students took the online Medical Terminology class under the Medical Office Specialist certificate. This is the first year that technical dual enrollment classes have been offered at the high school. “We had always offered dual credit, but it was academic and not career and technical education dual credit,” said Kenneth Driska Jr., Cameron Independent School District’s career and technical education director. Driska said a high school teacher was credentialed by TSTC in West Texas to teach the accounting classes. The school district built on its existing medical career tracks to branch into offering medical office specialist classes. Megan Redmond, a dual enrollment advisor at TSTC in Williamson County, worked with Cameron ISD to make the classes available. Students passing the courses are able to earn college credit hours and meet Texas high school diploma requirements. High school students taking certificate courses have the opportunity to earn up to 12 credit hours. Driska said some of the school district’s college-going culture is driven by local scholarship opportunities from the Callaway Foundation and the Cameron ISD Foundation. “We have high expectations for our kids in Cameron,” Driska said. This entry was posted in Williamson County on January 2, 2019 by Daniel Perry. 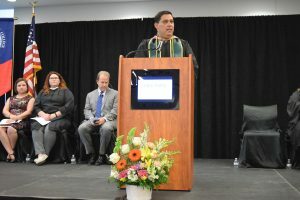 (HUTTO) – Fifty graduates received certificates and associate degrees at Texas State Technical College’s Fall 2018 Commencement held Friday, Dec. 7, at the East Williamson County Higher Education Center in Hutto. Former Texas Rep. Larry Gonzales was the guest speaker and talked about the graduates’ decision to pursue a technical education and their importance to the Texas economy. Many of the graduates already have jobs. Stuart G. McLennan IV, 38, of Georgetown received an Associate of Applied Science degree in Cyber Security and began work earlier this year as a TSTC instructor. Although still a student, McLennan taught some of the same cyber security classes he had already taken. “It will be nice to be done with the student side and done with exams and instead give them,” he said. McLennan earned a bachelor’s degree in computer programming several years ago but had difficulty finding work in the Killeen area. He decided to go back to college to expand his knowledge. “I have always been interested in the computer area,” he said. Some graduates are continuing their job search. Joseph Hartman, 20, of Jarrell received a certificate in Cyber Security. He said he was inspired to study the field after doing research while a student at Jarrell High School, where he graduated in 2017. “Coming here was a lot cheaper than going to a big university,” he said. His future plans are to pursue an associate degree, earn industry certifications and look for jobs in the Austin area. “I really want to start making money,” he said. TSTC has more than 900 students graduating this fall across the state. This entry was posted in Williamson County on December 7, 2018 by Daniel Perry. (HUTTO) – Jonathan Flores of Thrall was working in construction in 2014 when he was involved in an automobile accident in Williamson County. Flores was thrown out of the vehicle he was in and found out soon afterward that he was paralyzed from the chest down. At the time, he said he did not think much about college. But while recovering and adjusting to his life’s changes, he said he knew he needed to further his education. “If you want to do something, no matter what you want to do, you can do it,” Flores said. 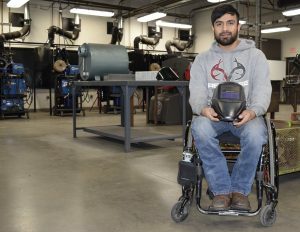 Flores, 24, is a candidate for graduation with an Associate of Applied Science degree in Welding Technology at Texas State Technical College in Williamson County’s Fall 2018 Commencement at 6:30 p.m. on Friday, Dec. 7, at the East Williamson County Higher Education Center at 1600 Innovation Blvd. in Hutto. With some minor adapting, Flores is able to weld in EWCHEC’s first-floor labs. He enjoys fabricating the most. 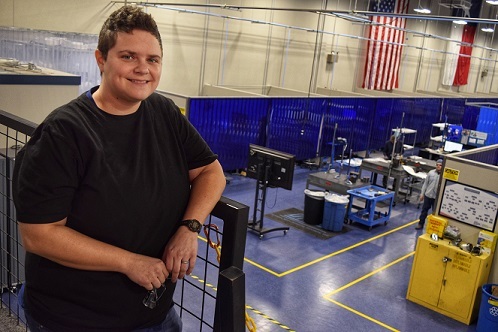 Samara Flener, lead instructor of TSTC’s Welding Technology program, said she and faculty members admire Flores’ work ethic, attitude and determination. When he is not studying or working, Flores likes to play wheelchair basketball in Austin. He said it is good exercise and a way to connect with others. Flores graduated in 2012 from Taylor High School, where he played soccer and took graphic design and engineering classes. “I would see people weld and it looked cool,” he said. His goal after graduation is to pursue a job in a fabrication shop in the Austin area. This entry was posted in Williamson County on November 30, 2018 by Daniel Perry. (HUTTO) – Texas State Technical College celebrated its summer commencement ceremony in Hutto Friday, Aug. 10. Twelve graduates walked the stage in the presence of their family and friends. Robb Misso, Founder and CEO of Dynamic Manufacturing Solutions, was the keynote speaker at the ceremony. He urged graduates to continue developing in their careers. Industrial Maintenance graduate Damian Helmbold was selected for the Provost Award, an award given to a student who has demonstrated high academic performance, exceptional character and student leadership, and who has influenced their peers to strive for excellence. Helmbold, who has worked for the city of Georgetown for nine years, credits his degree for his new position as a SCADA Technician, which he began six months ago. Precision Machining Technology graduate Wyatt Hauer was excited to receive his degree. At just 20 years old, he manages Four Points Platinum Machining. TSTC in Williamson County graduates earned degrees in six of the programs offered at the campus – Culinary Arts, Cyber Security, HVAC, Industrial Maintenance, Precision Machining Technology and Welding. TSTC is registering for the fall semester through Aug. 20. For more information on the college, visit tstc.edu. For a gallery of photos from the ceremony, click here. This entry was posted in Williamson County on August 11, 2018 by Debra Gonzalez.